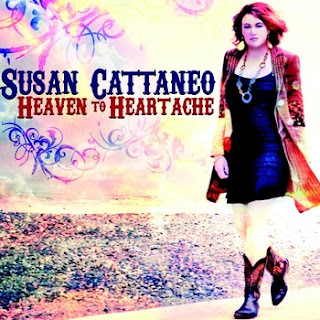 Susan Cattaneo is an American country rock singer-songwriter from New Jersey. As well as being a musician she is also a professor at the Berklee College of Music songwriting department. She played for various bands in college but she properly became active in the music scene when she released her first album in March 2009 entitled "Brave And Wild". The record was voted Boston debut of the year and one of the Top 10 records of the year. "Brave And Wild" is a powerful blend of country, rock and blues. Throughout many songs in the album Susan sounds a lot like British country artist Mim Grey but that is in no way a bad thing and this just serves to heighten her appeal. Susan has a talented way of being tender and soft in some of her songs but then turning it around and being a lot more gutsy in others. She then continued on to release her sophomore album, "Heaven To Heartache" in February of this year, something that was received well by many critics. She has a good mix of songs on both of her albums which keeps listeners interested and keeps word of mouth going about her and her music. She has an album full of good, strong songs and rather than the occasional filler in an album you get the impression that she has spent time working hard on the album. Perhaps my favourite song of hers is the song "Girl's Night Out" from her second album. It has a very catchy tune and memorable lyrics and has a story that anyone can relate to. She certainly knows how to use the web well and uses her profile on the website Twitter in order to get her name out there by following people that follow other country music artists or that show an interest in country music. Susan only has a few performances on the go in America but that is to be expected for someone whose name is not as well publicised as some of the other American country artists. I would definitely be interested to hear her play somewhere in the UK and I look forward to hearing more from her, four stars from me.